Glen Canyon Dam plugs the mighty Colorado River, holding back Lake Powell at Page, Arizona, a dam town that rose during dam construction that began in 1963. David Brower, then Sierra Club president deeply regretted the dam was ever built, spectacular Glen Canyon and its side canyons, silent voices of the Ancient Ones lost when the reservoir flooded. 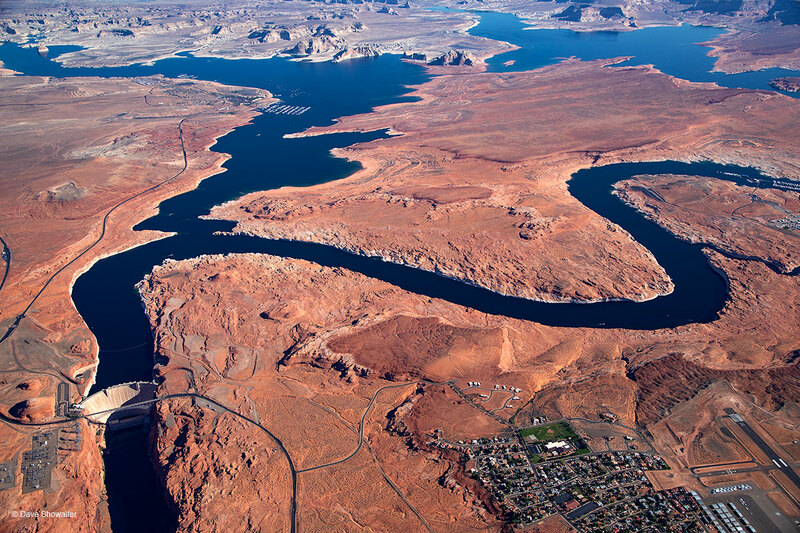 What will become of Lake Powell as we sink deeper into prolonged drought in the desert southwest? This image made possible with LightHawk aerial support. Photo © copyright by Dave Showalter.